It is relatively easy to create an economy that works for the rich but it is difficult to create one that works for the poor. But it isn't rocket science. The huge public investments in health, education and housing in the three decades following world war two demonstrated it can be done, lifting people out of poor housing and providing them with opportunities in education and work inconceivable before the war. The Tories and the Tory government, as did the Tory-LibDem coalition have instead targeted the deficit. They have not learned from history. Despite Britain being bankrupted by the war, and inspire of massive national debt, both Labour and Tory governments invested in social infrastructure and welfare - more so did Labour. 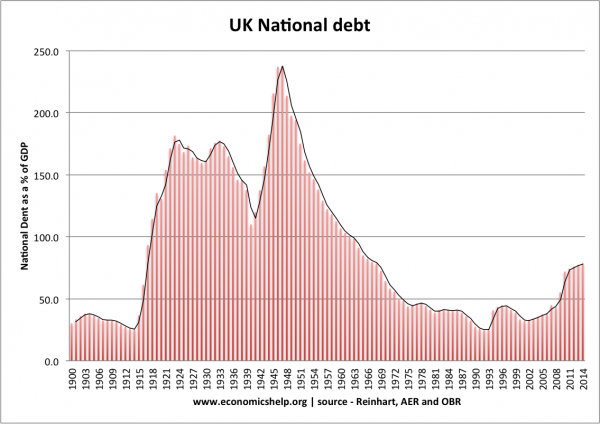 As the economy grew, the national debt fell precipitously. A healthy workforce became a more productive one; a skilled workforce become a more adapted one. Yet, now, cutting down the deficit has become an objective for a 'strong' economy with robust growth, but it is growth predicated on making the disadvantaged poorer. The government hails middlingly small growth as a sign the it is working. It isn't. Not for the poor it isn't Furthermore it is poor economics whether or not you care about the poor. This is why we need a more balanced economic strategy. Growth is necessary, but not sufficient as an answer. We need also a social strategy. Simply putting the nations finances 'in order' is not in itself an answer. A family could have a healthy balance in the bank but if the roof leaks it is more damaging than if the family had borrowed money to repair the roof. Putting the nations finances in order is also used by the Tory government as a cover for an ideological attack on the poor, but not on poverty. First they create a narrative of the 'undeserving', 'work-shy' poor. The Secretary of State for works and pensions has used this language time and again. They also talk of 'helping the poor help themselves'. The truth is that the vast majority of those receiving benefits are in work. Another part of the narrative is what is called 'welfare dependency' as if those on benefits are on a kind of benefits drug from which they have to be weaned with cold turkey. And so it is with working tax credits. Government ministers say that somehow this will miraculously increase wages. Yet, there is no process in any economic text I know that demonstrates this principle. The one I do know is that if you cut benefits to the poorest without lifting their wages then they will be pushed deeper into poverty. They won't be able to afford their rents and so are more likely to become homeless, their health will deteriorate and we end up with a poor, unproductive, unskilled workforce. It is simply bad, bad, bad economics. The government has no social agenda other than that of a Victorian era of 'self help'. But even the Victorians began to understand the importance of public health and invested in infrastructure to promote it. This government has lost sight of the social goals of good governance. To create health and wellbeing. It follows bad economics for bad social reasons. It pushes the poorest deeper into poverty for the sake of the illusive goal of 'cutting the deficit'. Cutting the deficit is a poor economic goal.